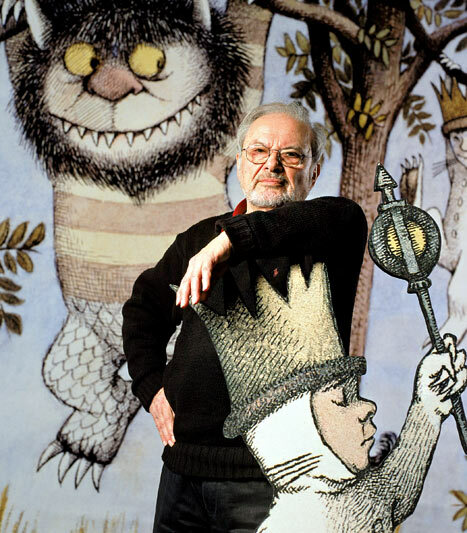 When I heard yesterday that Maurice Sendak, author of what has lately become a legend of sorts in the genre of children’s literature, Where the Wild Things Are, had passed away at the age of 83, I felt very sad. I tried to explain it to my friend, who had been the bearer of the news. I said in a text message, something like this, ‘It is not a personal grief, in a way, as I did not know him as a person. But it is, in part, a personal grief; the part of it that is the sadness for the death of someone who moved you.’ Being moved is, of course, a very intimate and personal experience. And the way you feel about the people who have been able to do that, to make you feel something profound and meaningful, is exceptional. This is interesting, as this can happen between two perfect strangers – like Maurice Sendak and I. We never knew each other, we never met – and yet, I will go the rest of myself feeling like I shared some kind of intimate bond with the man, simply because he was able to make me feel. Sendak was a man that stood his ground. He didn’t believe in underestimating the emotional range and incredible capacity for understanding that children possess. He didn’t believe in ‘dumbing things down’. He believed in allowing children to understand and accept their feelings, their realities, their struggles, to allow them to manifest, to tackle them, to overcome them. Max is the quintessential ‘problem child’ – though nothing about him is ever typical, just as nothing about any child ever is – and his journey is one that reflects the journey that perhaps all children, and maybe even young adults make; from anger, to solitude, to self-awareness, to security. Where the Wild Things Are perfectly combines the elements of story-telling; memorable characters, inventive yet familiar, a good plot, seemingly simple yet imaginative and the emotional progression of a protagonist that is flawed, but one you are rooting for anyway – because he reminds you of someone you know, maybe even yourself. It is the perfect kind of story; one that uses a simple plot as a vehicle for conveying something deeper, one that uses the imagination to address something very real. Ultimately, it also gives you a satisfying ending; the protagonist has learned something, you believe, as have you – something quiet, something subtle, yet it will be a lasting revelation. This, coupled with Sendak’s extraordinary illustrations, made Where the Wild Things Are exceptional and enduring. However, Where the Wild Things Are was more than a favourite children’s book to me. There are a few books in my life that have actually done more than been excellent reading matter; these books remain memorable to me as books that have shaped the very relationship I have with books and literature. They are the reason I am and will continue to be someone that reads, writes, and places importance in words. Salman Rushdie’s Midnight’s Children is one. It was while reading that, that I experienced one of the first moments in my life where I was stopping to savour words, language, and what it did to me; to say them out aloud, marvel at their flawlessness, let them drip from my tongue. Where the Wild Things Are is on this list. It captured my imagination, but furthermore, it helped to fundamentally define my relationship to reading and writing, to books, and to stories, at a very young age. It changed the way I saw books and related to them, deepening my bond with the things and ensuring that I would become someone that was deeply attached to them and what they stood for. I started to see the power of books, and indeed the power of stories. It was with Where the Wild Things Are, that I understood, even at a very young age, that stories, when told well, could be monumental, that they could landmark sections of your life, that books could become things by which you’d start to identify and understand important life experiences, that you would soon start to remember things in your life by which book you were reading then and what it made you believe at that moment. Like reading The Iliad at the end of a war, or The Time Traveller’s Wife at the beginning of a new relationship; books have defined the way I see life, the way I react to and interact with things and people around me, books have helped form ideas and opinions and helped to unravel complex emotions – by simply finding words on paper that make you go ‘Oh wow, yes, that’s exactly what I mean!’, by finding that someone else had been able to perfectly articulate something you’d been struggling to say. So, yes, a man whose book taught me to love books, has died. There is a special kind of grief reserved for a loss like that. May Sendak’s wonderful imaginings and stories live on – and may they marvel and inspire many more generations of potential readers, writers and book-lovers, who will in turn marvel and inspire yet many others with their own stories.